Congressman Bobby Rush, Cook County Board President Toni Preckwinkle, Audra Hamernik ED of IHDA, Richard Monocchio ED of HACC, and Joseph P. Galvan, HUD Midwest Regional Administrator gather at the celebration. 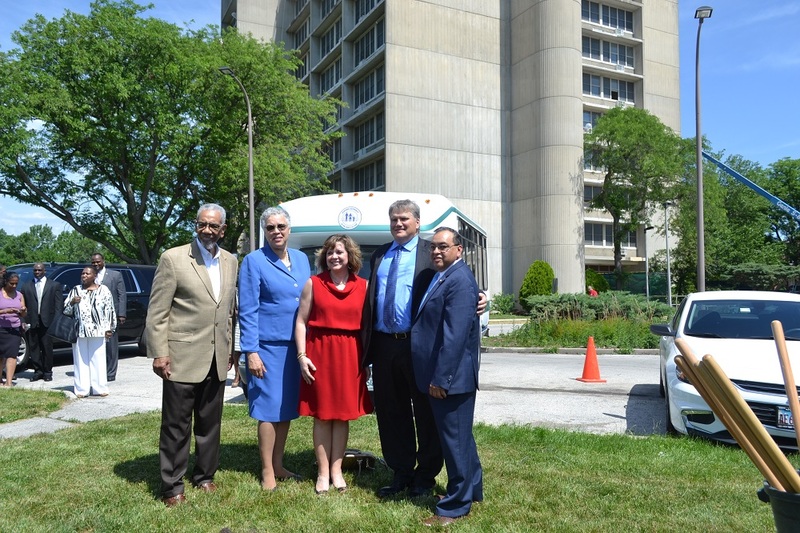 The Housing Authority of Cook County (HACC) was joined by Cook County Board President Toni Preckwinkle, Congressman Bobby Rush, Joseph P. Galvan, HUD Midwest Regional Administrator, Mayor John A. Ostenburg of Park Forest, IL and Audra Hamernik, ED of IHDA to announce ongoing plans to improve affordable housing infrastructure in four communities of low-income housing in some of the poorest areas of Cook County. Construction has officially begun on exterior and interior infrastructure improvements at five low-income housing properties that include 556 housing apartments located in Harvey, Robbins, Chicago Heights and Park Forest. The $75 million project will consist mostly of senior and disabled units. The Richard Flowers family site in Robbins will receive most of the financing to rehabilitate the family complex and includes a new playground. The project is projected to be completed at the end of the year and will provide workforce development training to residents, education and job opportunities in the south suburbs. Additionally, to support these projects, Cook County has invested $3 Million (part of a $12 Million, 2 year commitment to HACC), from their HOME Partnership and Community Development Block Grant (CDBG) Programs.